The internationally-renowned, 80-year-old Oregon Shakespeare Festival (OSF) isn’t really a festival in the traditional sense of the word. Like a Renaissance tragedy, it's epically long -- running this year from Feb. 27 to Nov. 1. And it doesn’t only focus on the works of William Shakespeare, as classics by other writers, musicals and new dramas complement the Bard's titles. Despite the misnomer, the high quality of OSF's theatrical offerings and the bucolic nature of its surroundings draw playgoers from all over world each year, including many from the Bay Area. (Nearly a quarter of the audience comes from San Francisco and its surroundings, according to OSF data.) Add to this the fact that Ashland, Oregon is among very few places in the world where you can get a discount at the local frozen yogurt shop simply by waving a theater ticket at the cash register, or have an in-depth conversation with a stranger in a bar about lighting design or the size of a lead actor's codpiece, and you've got a compelling case to make the five-and-a-half-hour drive north. It's a gorgeous drive -- and easy to do too, if you take a pit-stop in Chico for gas and a more leisurely break in Shasta City. Grab a cup of coffee and a muffin or wrap from Wassayak's ("Yak's") coffee house and wander along the main drag under the gaze of Mount Shasta, which looms at over 14,000 feet above sea level. Flying is also an option. Rogue Valley International-Medford Airport is 16 miles outside Ashland. Or if you prefer to travel more like Cleopatra or King Henry V, you can find a spot to park your private jet at Ashland Municipal Airport. Ashland is a tourist city, fueled by people who hike, bike and raft by day and eat out at restaurants and see shows at night. As such, the little town offers dozens of places to stay at all budget levels. But book early. Ashland's Airbandb options were full up a few weeks before I made my trip. I ended up at the quirky 1940s Manor Motel on the north side of town, a 10-minute walk from the OSF's trio of theaters. A suite with cute period fixtures and an endearingly ramshackle private garden ran me $145 a night. If you feel like splashing out, check in at the well-appointed and centrally-located Ashland Springs Hotel, built in 1925. (Rooms there cost up to $269.) At the other end of the spectrum, there's The Ashland Hostel, where if you plan far enough ahead, you can score a bunk bed in a dorm for only $28. It's handily close to the theaters for families, singles and groups. And the price is right, given that tickets to see plays at the festival range from $30 to $120. Then there's the food. Some of my favorites from this year's weekend of play-going include breakfast at Brothers' (excellent omelettes and hash browns), ribs and strong hard cider at Home State BBQ, Taj Indian Cuisine's flavorful curries, the river view from the deck and the cheesily-named but tasty Shakespeare-themed cocktails at Oberon's Tavern, coffee and pastries at Mix Bakeshop and Smithfield's for the unmissable bacon beignets. Now to the plays. This year’s 11 productions include, among others, Shakespeare's Antony and Cleopatra, Much Ado About Nothing and Pericles, Eugene O'Neill's Long Day's Journey Into Night, a world premiere musical -- Head Over Heels -- by Avenue Q creator Jeff Whitty featuring the songs of 1980s girl punk band The Go-Go's, and Sweat, a new drama by Pulitzer Prize-winning playwright Lynn Nottage. There's also free performances most nights of the week at OSF's outdoor "Green Stage." I was happy to catch a Chinese dance display one evening, and a local rock band the next before heading into the main venues (OSF has three auditoriums all located right next door to each other) for my ticketed shows. As for those shows: I didn't adore every single thing I saw during my weekend of theatrical bingeing, but the five mini reviews below indicate that this year's festival is well worth the effort. I only wish I could have stuck around for all the productions I couldn't pack into three days. 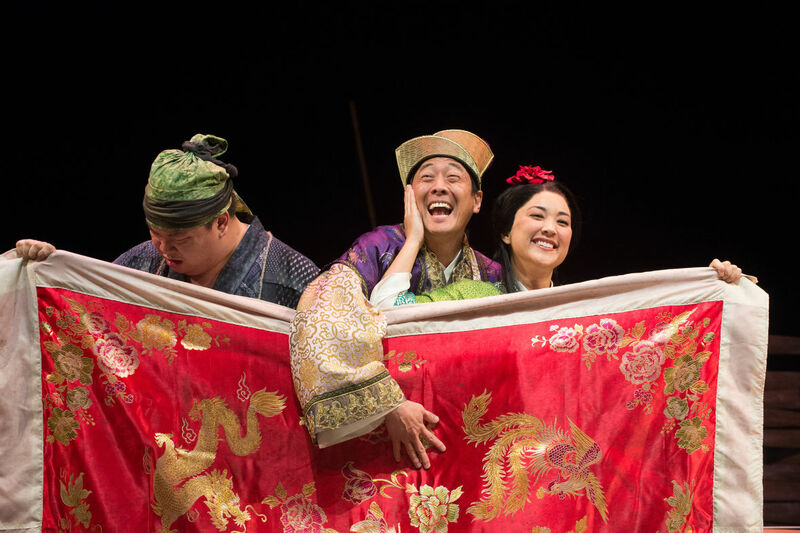 Soon after American-born, Taiwan-based director Stan Lai’s play first appeared in the mid-1980s, the world started paying serious attention to Taiwanese theater. That’s no surprise: The conceit of the plot -- which revolves around dueling theater companies trying to rehearse two very different productions in the wake of a farcical scheduling error which forces them to compete for space -- might be stagey. But as a metaphor for the complexity, chaos and confusion that ensued in the years following Taiwan’s independence from China in 1949, it’s both deeply entertaining and intellectually chewy. In “Secret Love,” one of the plays-within-the-play, young lovers tragically separated by conflict come together in old age to lament and reminisce. Meanwhile, the other play -- a satirical take on a classical Chinese drama “A Chronicle of the Peach Blossom Land” by the eminent 4th century poet Tao Yuanming -- is a comedy involving a cuckolded husband’s journey to a utopian land populated by flowering fruit trees and butterfly-rehabilitating hippies. OSF’s staging, the first professional production of the play in the United States, deftly draws out the parallels between the two theatrical endeavors. Both involve love triangles and a yearning for an ultimately unattainable Shangri-La. The meta-theatrical content is at times a little heavy-handed. But the crunchy combination of slapstick comedy versus quiet emotion and ancient versus modern theatrical forms keeps us thinking long after the harassed stage manager shows up at the end to throw both casts out onto the street. Guys and Dolls is a product of its time. The brassy 1950 musical based on several stories by Damon Runyon follows an improbable romance between a rapacious gambler and prim salvation army organizer. Throughout, women are relegated to the roles of housewife or whore while men do nothing but tell lies and waste money. Yet just as Nathan Detroit and his low-life cronies can’t help rolling the dice, it’s hard not to fall in love with composer and lyricist Frank Loesser’s bombastic show tunes, like “Luck be a Lady Tonight” and “Sit Down, You’re Rockin’ the Boat.” OSF’s infectious production combines energetic ensemble scenes choreographed by Daniel Pelzig with magnetic solo performances. 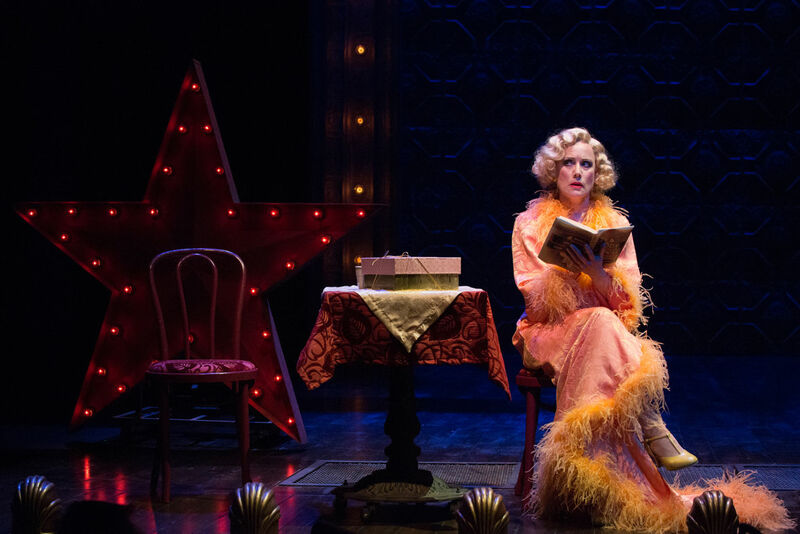 Among the standouts in the formidable ensemble cast are Jeremy Peter Johnson as huckster-with-a-heart Sky Masterson and Robin Goodrin Nordli’s Adelaide -- a showgirl enduring a 14-year-long courtship that gives her a perpetual sinus infection rather than a lifetime of connubial bliss. Mary Zimmerman adds further smarts to the show: In her program notes, the director says that if there’s one thing that unites all of the characters it’s the desire to “find a home, a haven and familial love.” This vision adds a touch of universal pathos that helps even jaded contemporary audiences to connect with the old-fashioned work. Lynn Nottage doesn’t shy away from difficult topics. The playwright’s 2008 drama Ruined unflinchingly tackles the abuse of women during the Congolese civil war. With her new world premiere co-commissioned by OSF and Arena Stage in Washington DC, Nottage stays closer to home. Set in Reading, Pennsylvania, a post-industrial town ranked the poorest in the country by the 2011 census, Sweat follows the misfortunes of a group of residents struggling to survive in a city where the main employer, a steel factory, is cutting costs. Nottage, together with director Kate Whoriskey, conducted interviews with people in Reading to help shape the narrative. 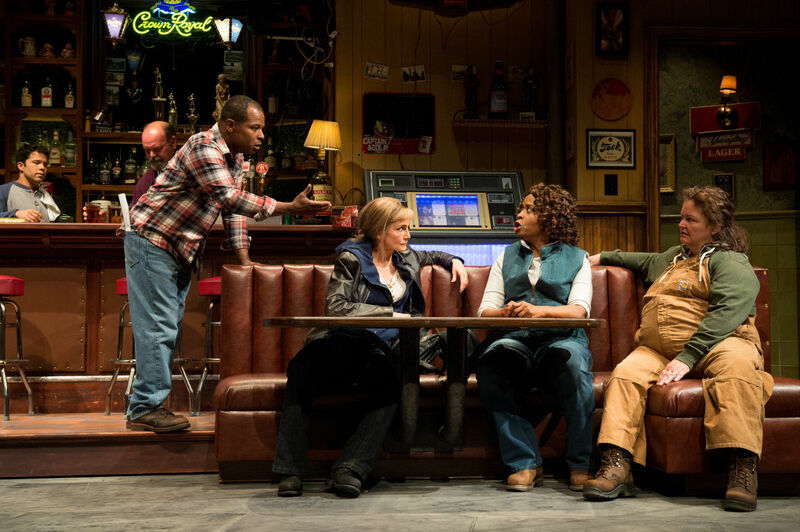 Yet despite the extensive background research and the high-stakes drama of the plot, which focuses on the lead up to a serious crime committed by two young men, one white and one black, the play feels as generic as John Lee Beatty’s set design of a neighborhood bar. From the vinyl upholstery on the seats to the sports memorabilia on the walls, this could be in any dive in any depressed North American city. Similarly, Nottage has created symbols rather than characters. Oscar, a young Dominican busboy who hopes to improve his standard of living by getting a job at the factory, seems like a stand-in for so many disenfranchised Latino workers across the land; and Jason, an angry white supremacist whose main goal is to keep his job on the production line is similarly one-dimensional. Despite the play's dramaturgical shortcomings, the cast manages to draw out the humanity in each character. 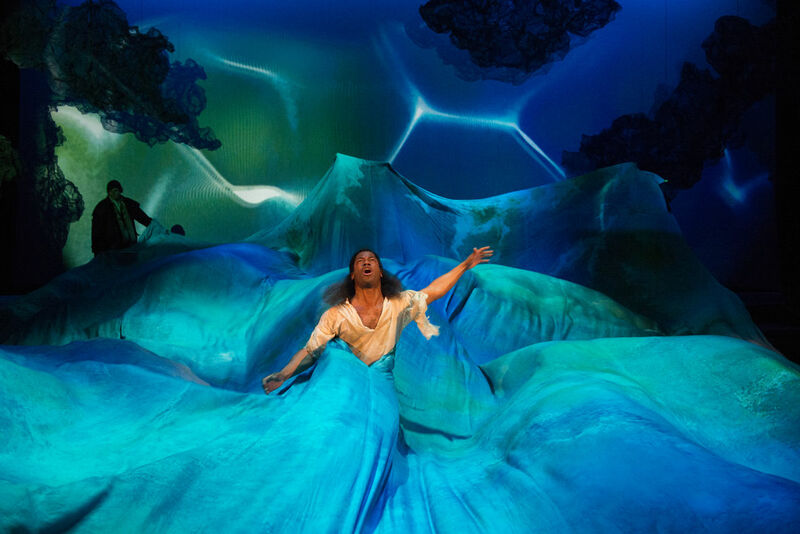 Shakespeare’s romance, Pericles, takes the theatergoer on a fantastical trip. Over the course of five acts that follow the rough and tumble of a prince’s seemingly endless voyage across storm-toss'd seas, the story visits so many different Mediterranean locations that it gives us whiplash. Multiple living characters are mistaken for corpses. And in perhaps the most improbable of the work’s many improbable moments, the title character’s daughter suddenly gets carried off by a bunch of marauding pirates. Theater scholars and companies find the play baffling, so it doesn’t often get produced. Yet for all of its madness, in the right hands, Pericles can be a deeply moving experience. In his staging for OSF, director Joseph Haj rightly rolls with the drama’s many madcap punches. He draws out the play’s tender meditation on the themes of love, loss and reconciliation while mining some scenes -- even one or two that don’t seem all that funny on the page, like Pericles’ courtship of his soon-to-be-wife, Thaisa -- for broad humor. Helmed by the poised yet vulnerable Wayne T. Carr as Pericles, the multi-faceted ensemble cast leads the audience through the drama’s many swings of mood and place with ease. The only thing wearying about this otherwise satisfying dramatic journey, is that the director takes the play’s opening words -- “To sing a song that old was sung” -- a little too literally. Singing rather than speaking lines can have a powerful effect when used sparingly, but overdoing the music undercuts the emotion of the story. In Shakespeare’s plays, women who make trouble, like Beatrice in Much Ado About Nothing and Kate in The Taming of the Shrew, generally end up falling into line. 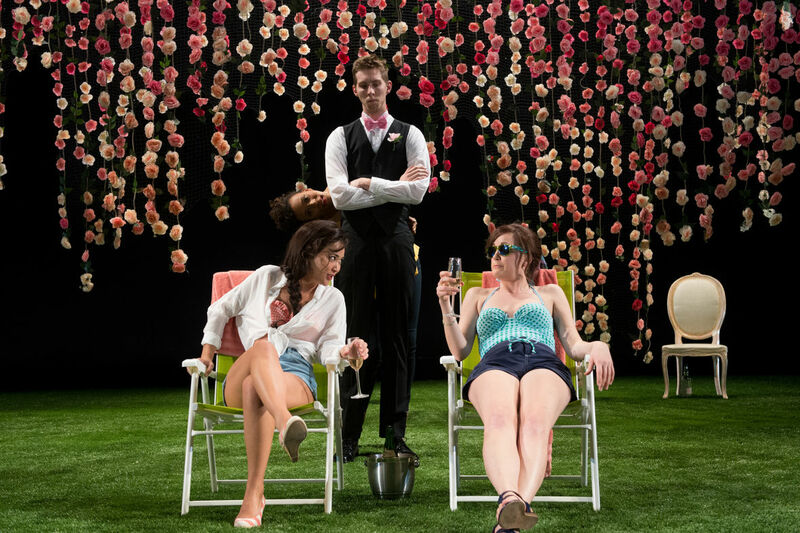 But in Lileana Blain-Cruz’s thoughtful, boundary-pushing production of Much Ado, it’s not Christiana Clark’s overbearing Beatrice who shapes our view of femininity, so much as the performers behind a couple of the stormy comedy’s less prominent characters. As Hero, the “short daughter” of the powerful Governor of Messina, Leonato, Leah Anderson quietly yet passionately displays her displeasure with how she’s treated by the men who surround her and the patriarchal system that seeks to put her in her place as a wealthy, single woman of marriageable age. In one of the OSF’s most innovative casting decisions to date, the wheelchair-based actress Regan Linton brings fire and ire to the role of Don John, who vindictively sets out to destroy the proposed marriage between Hero and the dashing young soldier Claudio. The part is normally played by a man. But in this production, Don John is a female soldier reeling from the effects of post traumatic stress syndrome (PTSD). Linton’s magnetic take on the character gives definition to the shady motives of her character. The combined impact of all this female rebellion is one of utter disruption to the old world order of courtly love and military might. Set designer Scott Bradley evokes this idea in a visually powerful way towards the end of the play, when the hundreds of dangling floral garlands that have been hanging from the ceiling on a trellis of army camouflage netting all at once plummet to the floor. Far from being a fluffy love story, this Much Ado is dark, dense and fresh.